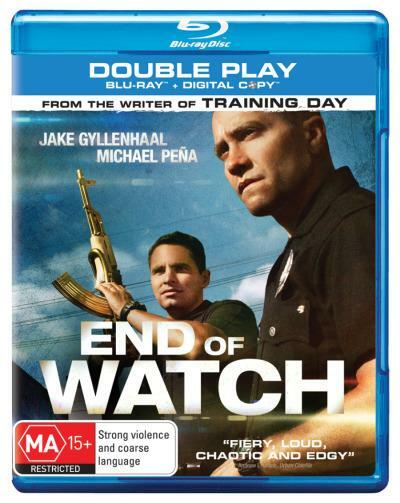 End of Watch Blu-ray Review Police dramas aren’t usually my thing but after End of Watch I may reconsider. A film this entertaining and touching demands your attention and it’s insulting that neither Gyllenhaal nor Pẽna were recognised for their efforts by prestigious film institutions. If like me, you forgot to add this to your list of must see movies, go grab a pen and do yourself a favour. Of all the movies I missed out on seeing last year, End of Watch would have to be my biggest regret. This buddy cop action thriller starring Jake Gyllenhaal and Michael Pẽna has everything I want from a movie; great characters, funny dialogue, engaging action and emotional storylines. I can safely say that End of Watch would have to be one of the most refreshing and unique movies I’ve seen in a long time, and if I got around to seeing it last year, it could’ve easily been a contender for my favourite movie of 2012. End of Watch has a very organic and natural feel to how it’s presented. The early stages of the film are shown from the perspective of Gyllenhaal’s character Taylor, who is filming his everyday life as a policeman for one of his university projects. The film slowly drifts away from this angle in order to show more characters and subplots which makes sense but can catch you off guard if you aren’t fully engaged. Performances across the board are terrific but the real highlight of End of Watch is watching the chemistry between Gyllenhaal and Pẽna. Their chemistry is some of the best I’ve seen period, and their interaction and conversations with each other vary from hilarious to emotionally touching. There’s some great direction and cinematography to be found in End of Watch but at times the dialogue was incredibly cheesy it was downright distracting. Director David Ayer wrote this film in less than a week, and while the occasional profanity and cliché filled scenes makes this obvious the rest of the film is completely engrossing. Police dramas aren’t usually my thing but after End of Watch I may reconsider. A film this entertaining and touching demands your attention and it’s insulting that neither Gyllenhaal nor Pẽna were recognised for their efforts by prestigious film institutions. If like me, you forgot to add this to your list of must see movies, go grab a pen and do yourself a favour.